I was getting a bit worried about Butter. Not worried, really, but wistful. He hasn’t gone through the Age Three Incessant Why phase. And I rather miss it. I loved telling Peanut several years ago why the sky is blue and why there are white and yellow lines on the road and why bread has holes in it and why toilet paper comes on rolls. I love why, that’s why. But Butter doesn’t ask why. 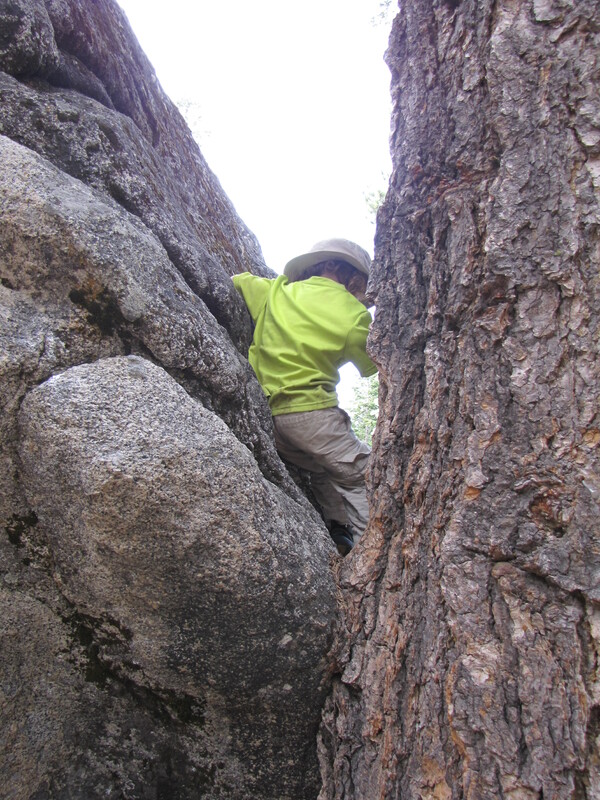 Look at that: navigating between a rock and a hard place. And I wondered, for the briefest moment, if he might be his own person, built differently than his brother and I are. He’s not of course. He’s my baby doll to do with as I please and to coerce into my plans and to bend to my whims. So as I longed for the Whys and fretted a bit and wondered if I’d missed an important phase, I realized the reason Butter has skipped Why. Hard to argue with maybe, I guess. Can’t imagine where he learned that. So instead of searching for a scientific cause, a reason for that which is, Butter’s looking for a nuance that will let him out of the laws of physics. And society. And the space-time continuum. He’s looking for an out, not a why. I think a legal career, maybe. Or advertising. Shades of gray. Politics, perhaps. This entry was posted in Child Wrangling and tagged parenting a goofball, three year old. Bookmark the permalink. He’s going to be Galileo. I loved this story. Oh, I loved this one, too. My youngest is as different from my eldest as day is to night. They have such different personalities and styles of living. So yeah, I related to this an awful lot. I love Butter’s belief in possibility. I hope he never loses it. Oh he’s going to invent something new, that one! An idea, a ‘how-did-we-ever-live-without-that’ product, a philosophy. Something new that no one else has thought of yet. I can just feel it. Maybe. I won’t tell you “yes,” because MAYBE. Me, too. I hope he never loses it. You can borrow my kid. She asks “why” all of the time. So did my first. It was constant and it was awesome. Little scientists. I’d be happy to borrow yours! I really like that ‘maybe’ point of view. Like anything is possible. That’s pretty awesome right there. It really is. And barring just a few things, like reversing gravity, most of life is a maybe.